Age: 21 to 40 years as on 1st January 2016. Educational Qualification: Bachelor Degree in Science or with subjects Statistics, Geography, Environmental Science or Geology as a subject or Diploma in Civil Engineering or Architecture. Computer Skills: Usage of MS Word/Excel/Power Point/ Internet/ Email. Preference will be given to the candidates having done BCA or equivalent course on computer. 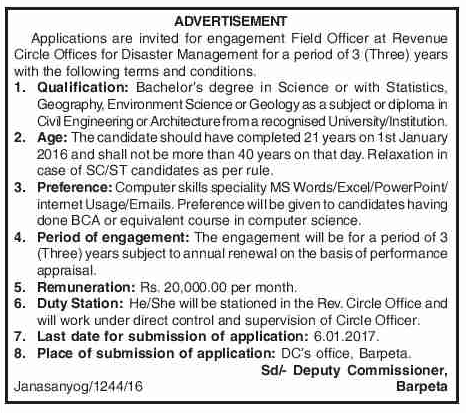 How to apply: Applications must be submitted within 6th January 2017 at DC Office, Barpeta. Advertisement Details : Click Here .